16 April 2014. A clinical trial of a cancer vaccine developed by biopharmaceutical company Celldex Therapeutics Inc. in Hampton, New Jersey shows it generated an immune response which affected the growth of tumors in some patients with advanced stages of cancer. The early-stage trial, conducted with researchers from seven university or research institute labs appears in today’s issue of the journal Science Translational Medicine (paid subscription required). The clinical trial tested the safety and tolerability of Celldex’s vaccine code-named CDX-1401 at various dosage levels, but also recorded evidence of clinical benefit. The vaccine contains an antibody to stimulate the immune system targeting receptors of dendritic cells presenting antigens to T cells, the lymphocytes or white blood cells that fight infections or cancer. In this case the immune response aims specifically at cancers expressing the protein NY-ESO-1, associated with a number of cancer types: bladder, breast, ovary, non-small cell lung cancer, myeloma (plasma cells), sarcoma (soft tissue), and melanoma (skin). The study enrolled 45 patients with advanced cases of cancer who had not responded to previous therapies, of which 42 completed the treatments. The patients were given CDX-1401 injections in various doses, along with drugs supporting the immune system Hiltonol and resiquimod, over six weeks. The researchers report no patients suffered serious adverse effects from the treatments. The most frequent side effects were fatigue, nausea, and chills, as well as reactions at the site of the injections. Most of the patients receiving the treatments — nearly 8 in 10 (79%) — showed at least some immune system response. A little more than half (52%) showed a high immune response to the treatments and one-third (33%) had a very high response. Moreover, the cancer in 13 of the patients stabilized, where the growth of the tumor stops but the tumor still remains. Patients with a specific T cell immune response to the NY-ESO-1 protein showed a higher stable disease state (46%) compared to those who did not have that response (13%). In addition, two patients with melanoma experienced a shrinkage of about 20 percent in their skin lesions. The study included a two-year follow-up with patients, including 6 melanoma patients also receiving treatments with ipilimumab — marketed as Yervoy by Bristol Myers Squibb — and 2 non-small cell lung cancer patients receiving an experimental checkpoint inhibitor that makes the cancer cells more susceptible to therapies. Of the 6 melanoma patients receiving ipilimumab, 4 experienced reductions in tumor size. Both of the non-small cell lung cancer patients also showed reductions in tumor size. 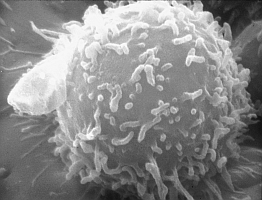 The researchers report all 6 of the patients experiencing a smaller tumor response also had tumors expressing the NY-ESO-1 protein, with most of those showing an immune response to that protein. Celldex Therapeutics says it plans two more studies of CDX-1401 in combination with other drugs later this year.